Manage, Play, Convert, Merge, Split, Rip, Burn and Record! with high-performance for managing, playing and converting tons of music/ video files. or convert, merge, split your favorite songs easily! including MP3 player, iPod, mobile phone, PSP, computer, Hifi and car. volume and channels of a music file to maximize your listening experience! 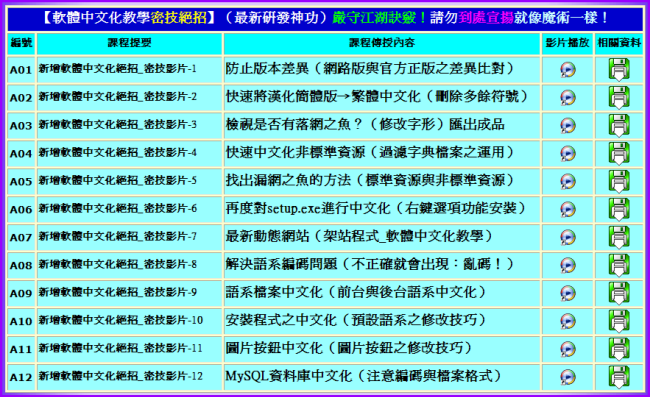 ‧內建的UDF Reader的UDF 1.02（如DVD），1.5（如封包寫入的CD-R，DVDR，CD-RW和DVDRW）的UDF，UDF的2.01，2.50，2.60（如BD-R的SRM +戰俘）。 ..
IsoBuster is an award winning , highly specialized and easy to use CD and DVD data recovery tool. It supports all CD and DVD formats and all common CD and DVD file-systems... Rescue lost files from a bad or trashed CD or DVD disc, save important documents, precious pictures, video from the family, your only system backup, ... Start up IsoBuster, Insert a CD or DVD, select the drive (if not selected already) and let IsoBuster mount the media. IsoBuster immediately shows you all the tracks and sessions located on the media, combined with all file-systems that are present. This way you get easy access, just like explorer, to all the files and folders per file-system. Instead of being limited to one file-system that the OS picks for you, you have access to "the complete picture". Access data from older sessions, access data that your OS (e.g. Windows) does not see or hides from you etc. • All device access, media access, data gathering and interpretation is done exclusively by the software. It does not rely on Windows to provide or interpret the data and so can work completely independent from Windows' limitations. • Better Error handling and several retry-mechanisms to aid you in getting the data anyway. • The use of both generic and alternative ways to get to the data, get the best out of your CD/DVD-ROM drive. • The use of primary and secondary file-systems to get to the data and/or make use of file system data that might be ignored or ‘forgotten’ by popular OS. Explore the alternatives. • Read / Extraction from open sessions. • All sessions, including older ones, are accessible and can be recovered. • Read and Extraction of files, CD/DVD images, tracks and sessions from all optical media. • Scanning for lost UDF files and folders. More on UDF recovery. • Scanning for lost ISO9660 / Joliet sessions. • Support for Direct CD compressed files. Decompression on the fly. • Find lost pictures created and saved to CD or DVD with Sony Mavica, other digital cameras or other devices with embedded UDF write functionality. • Find lost movies created and saved to CD,DVD, BD or HD DVD, with Hitachi, other digital cameras or other devices with embedded UDF write functionality. • Auto find extensions based on file content to try and give an appropriate name to an orphaned file. This built in file identifier assigns the proper extension to the file so that Windows applications can open the file. Only needed for orphaned files without a name. • Support for formatted CD-RW discs mounted in very old drives that do not know the CD-RW fixed packet format yet. Auto detection and automatic remapping which can be switched of or forced at all times. Built in Method 2 remapper. • Built in HFS Reader, supporting HFS and HFS+, the Apple Mac file systems. • Includes a vast range of features for Mac files support on PC (HFS, ISO9660, UDF), including Mac Binary extraction of files. • Recover data from blanked or quick formatted DVD+RW media. • Ability to create managed image files (*.IBP / *.IBQ). • Enormous file system coverage and different ways to use them all (find the one suited best for your needs). CDs and DVDs often have different file-systems pointing to the same files. This offers possibilities. • Transparent support for (open) DVD+VR(W) discs, remapping of the content etc. Open +VR discs' files can be seen and extracted right away. • Support for the CD-i file-system and the different behavior from drives trying to mount a CD-i disc. • CD/DVD/HD DVD/BD Surface scan to see if there are physical read errors. • Opens checksum files (*.md5) and automatically verifies the image with the checksum file. • Check if all files and folders are readable without having to extract all data to HD. • Sector Viewer. Check a sector's content in IsoBuster's editor and print or save to HD. Engineers and computer savvy people find missing data making use of Sector View. • Compile (and edit, save, print) lists of all files that contain physical read errors. • CD-Text support from CD and various image files ( *.PXI, *.CCD, *.B5T and *.CUE image files). • Conversion of all supported image files to bin/cue files. • Handles opening of multi-file image files. • Extraction of Audio tracks to wave files. • Play audio analogue. Instruct the drive to play the audio through the analogue output. • Support for bootable CDs and DVDs. Support for the El Torito standard. • Add, Edit, Delete files found based on their signatures. reconstructing and decompressing the module. compression algorithm due to its CODEC plug-in support. Included compression algorithms are listed here.